Finally! The scriptures are presented in an ABRIDGED format designed just for young readers. Perfect for personal and family scripture study! Would you love for your children and grandchildren to get more out of reading the scriptures? The Book of Mormon for Young Readers presents key scripture stories in an abridged, creative, and engaging format designed to make it easy for children to understand and love the scriptures! Young readers (ages 7-12) can enjoy the scriptures on their own and establish a habit of personal scripture study, which will strengthen their faith and their resolve to live the gospel. Special features help families to see how the scriptures apply to their lives today. These fifty-two exciting chapters make it clear that Jesus Christ is our Savior and our Redeemer and that happiness comes from obedience to His teachings. You'll be amazed at how much easier scripture study is for your children! Special features include over 90 full-color paintings, maps, timelines, hard word definitions, suggestions for applying scripture principles, quotes from prophets, and more! *This is an ABRIDGED version of The Book of Mormon. Spiral-bound hardcover. Kelli Coughanour has loved studying from the Book of Mormon ever since she served as a full-time missionary for The Church of Jesus Christ of Latter-day Saints. She has been in the directory publishing industry for over twenty years and is the cofounder of Statewide Publishing-WA. Most important, she is a wife, mother, and grandmother. Kelli and her husband, Eric, are the parents of five incredible children and two amazing son-in-laws, and the grandparents of one adorable grandson. Her sincere desire is to help children to love studying from the scriptures so they experience greater faith in Jesus Christ and resolve to live His gospel. We were looking for something to help us make reading the Book of Mormon less of a chore, and more involved with our three kids. We are so happy we found the Book of Mormon for Young Readers. It broke up different parts into very easy to digest packets of information, in a very organized manner. We read every night, and the kids (no joke) often fought over who's turn it was to read. It made a huge difference in getting us in a consistent track for reading as a family. Highly recommend this. As an aside, my kids are early teen to almost ten (3 of them). I first saw this book when I was at Time our for women and immediately thought I have to have this for my family. We have a wide range is ages for our children so it’s sometimes hard for my younger ones to really understand everything when we are just reading from the scriptures. However with this they are able to read and follow along and gain a better understanding as we read. I especially love how it tells them the meaning of words that they wouldn’t have understood otherwise. Now my 7 yr old is starting to read it on her own and ask herself the questions at the end of the chapters. I really think this will help her to gain a greater testimony of The Book of Mormon at an early age. I look forward to one coming out for the New Testament and I know it will be something we cherish as a family as we study the scriptures together. We absolutely love this book! We have been reading it with our young children for the last several months. It has actual verses from the Book of Mormon (enough to get the context and story but not so much to overwhelm the children). It highlights words that might be new to the children. I especially love this aspect, because I have really seen my kid’s understanding of the scriptures increase. I also love that each chapter has a scripture to memorize. We try to read one chapter a week with the kids. Every day we review the scripture we’re memorizing that week and then on Sundays we try to review all that we have memorized so far! I’m so impressed with how well my kids are doing (way better than my husband and me)! I also think all the applications and discussion questions have really helped my children and myself to be able to liken the scriptures unto our selves!! Seriously, I can’t say enough post things about this study guide! I can hardly wait until other books, specifically the New Testament for next year, are put out by this author!! It has greatly enhanced our scripture study and made it something that our kids look forward to each night. I read to my granddaughter every night from this book. We began reading the standard B of M, but had a difficult time understanding it so I bought "The Book of Mormon for Young Readers" and it is alot easier to understand. It gives references to the standard book along with scriptures to memorize.. You can put your name in place of various names and it carries a deeper impact. It gives meanings to a lot of phrases through out the book. We love it! Heehee I didn’t read the description very well as it clearly states is an abridged edition. But it’s an absolute wonderful resource. You need to know beforehand that there is quite a bit of material that has been omitted. That fact definitely should have been noted in the description. I am a Grandma and bought the book specifically for me! I have read the Book of Mormon MANY times and always seem to get mixed up during the book of Mosiah. The Book of Mormon For Young Readers finally explained it so that I was able to untangle my brain and get the story straight!!! I love the pictures, maps, the synopsis at the beginning of each chapter, hard words being defined, journal prompts, “think” questions. When I first looked at it, I was a little concerned that each page seemed “too busy”. It only took me a day or two to see how the sections worked and it became very easy to follow. I purchased a copy for my 12-year-old granddaughter and I am planning on giving a copy to our new son-in-law who is investigating the LDS church. He has read the Book of Mormon and I think this is a great way to have him read it again. I think EVERYONE can learn from this amazing book. Love this Book of Mormon Family Book. My family loves to read this book! I have recommended this book to many people! We own lots of books to help with reading and understanding of the Book of Mormon. This book is by far is our absolute favorite! We love the images... wording ... size and how it is bound. This is an absolute must have for every family no matter the age of your children. I personally love to use it in my own personal study as well. No, It does not contain every verse and chapter BUT it contains the meat of the Book of Mormon and is a great study guide. $40 for a spiral bound book?? Ouch! I have to say, I do like the content of this book. We read it with my 8 and twin 5 year olds each night and everyone is getting so much out of it and even more importantly, retaining it! It is abridged, which of course is what helps make it easily digestible for young readers. Perhaps some important content was left out (including some scripture mastery verses) but all in all I’m not upset by this. What I am upset about is the cheap quality of the print and binding. It really does just fall apart despite being so careful. I am surprised a $40 book doesn’t come better made. It is a big damper. With better quality printing, I would absolutely have given this a 4 or maybe even 5 star rating. I’m hopeful that they’ll come out with more like this for the rest of the scriptures, but fingers crossed they find a better printing option. Our family loves studying and reading this book! It has made the scriptures come alive. I’m not sure who has learned more, my husband and I or my children. It makes family scripture study so easy. I can’t say enough good about it. I’m so grateful to have it in my home for my kids and our family to read. This book has changed the way we read scriptures. As a parent I used to dread reading with my kids because it seemed all I got was blank looks. We have successfully read our scriptures daily for months now. All the extra little "helps" have made all the difference. We don't only read the scriptures, but we have discussions about different topics. We have seen the scriptures come alive in our children's eyes. Thank you Thank you for such a great book that has helped my boys understand the stories in the scriptures and how they can us them in their own lives. It has created opportunities for some really great conversations with our kids and helping them understand what they are reading. I don't think we'd have had several of the discussions we've been able to have without this book. It's really helped our entire family delve a little deeper. Even our 4 year old participates and has shared some great thoughts with us. To say we love this book is an understatement! We love this book! The first year this book came out I bought it for all of my 7 children so that my 29 grandchildren would have it available in their homes. They love studying from it and journaling in the companion book. They love how interactive it is with all the maps and questions. The beautiful pictures bring the stories to life. The author has filled a gap that has existed for children and the materials to help build strong testimonies. I am so happy with this book. It is a wonderful resource for my 3 young children and family home evening too. I really wish they would publish one just like this for the Bible. This book helps my children REMEMBER the scriptures. I purchased this book when my husband deployed, and my kids were having a difficult time focusing on doing scriptures. It has really changed how we do scripture study at our house! My oldest loves reading, and it has been so helpful to have the difficult words in parenthesis to help them actually understand what we are reading. I love how there are summaries in the beginning of each chapter, it helps my children understand what we are reading about, and when we get to specific parts in the scriptures, they recognize things from the summary. Also, at the end of each chapter there is a section of questions that apply to each chapter, and how to apply to our lives. Instead of just reading the scriptures and being done, we now discuss things I wouldn't have thought to talk about, in relation to what we read. I also love the random quotes and scriptures that are posted throughout the book. 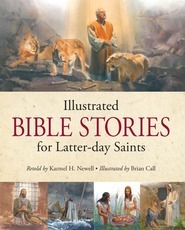 The pictures are great, and my kids are excited to do scripture study every day. The only parts that I don't love, (and I really, really do LOVE this book!) are the pages are a little flimsy, I don't let my smallest children handle the book to make sure they don't rip. Also, I wasn't aware when I purchased that it was missing sections of the scriptures. This wouldn't have changed my mind in purchasing, as my children have learned SO much more than with other children's scriptures, and the way it is put together is teaching them the stories of the scriptures. I love having a scripture study book that works and makes sense to my children! 1. Each lesson includes a quick summary of what we will be reading about in that lesson. Especially handy for my struggling reader to know beforehand what we will reading about. 2. Each lesson has a short scripture chosen that we practice, memorize, and pass off at the end of the lesson. I typed, numbered, and laminated all of the memorization scriptures and put them on a ring. Each child is assigned a colored dot and once they've passed off the scripture for that lesson, they can add their dot to the card. I love that the scriptures are short so even my 5 year old can memorize it in a weeks time. 3. Each lesson includes suggested primary songs that go along with the scriptures you are reading about. 4. The lessons include colorful pictures, quotes from prophets and apostles, and suggested questions. The questions invite a lot of discussion about gospel principals between me and the kids. 5. Within in the text, difficult or unknown words are paired with a parenthesis of an explanation or substitute word which makes certain passages/words so much easier to understand. 6. Not every single scripture is included in the reading. The ones listed are the ones that are pertinent to the story being told. I like this because my kids are inexperienced readers and comprehension is not always there, especially when reading scriptures. The scriptures we read in the lesson make it easy to follow the story. I bought and laminated some paper Book of Mormon characters from someone on Etsy and put magnet tape on the back of each one. We use these magnet people on a cookie sheet as a visual for the stories we are reading about. We love this book so much! It has really changed the way we study, not just read, the scriptures. I have struggled to find a good way to help my kids learn, understand and find a love for the scriptures. My kids are 8, 6, and 2. We tried just reading straight from the Book of Mormon, we've tried other guides directed toward children but they summarized the scriptures instead of helping them learn the language to be able to read on their own. Then we found this book. Book of Mormon for Young Readers has changed the way we study together. What was once a battle, is now enjoyed and looked forward to by our family. I love how it explains the language of the scriptures. It breaks the scriptures up by stories and adds words from latter-day prophets, linking past with present. We have been encouraged to memorize scriptures but for my kids, while passage is too much. They offer one liners my children can easily memorize and recall when needed. Even my two year old has a few memorized from hearing us say them. I really can't talk up this book enough. It not only has helped my children's understanding, but mine. From struggling in my personal study, to finally understanding and being able to teach my kids has been a real relief. Thank you so much for writing this book. Everyone would be blessed to own a copy. I think this book is done very well, but beware that it skips verses and even chapters. We got past 2 Ne 1-5 and it jumps right into Jacob. I was blown away at how much it skipped. It's ironic, too, because on the very last page of the book is quoted the scripture from 2 Ne 32:3 about feasting upon the words of Christ. My kids enjoy the book, and so do I, but skipping that many chapters frustrated me a bit. I didn't mind the passing over of some verses because the story was still complete. We will now go back and read those chapters (2 Ne 6-33) in the Book of Mormon because there is some great stuff in those chapters! I don't skip the Isaiah chapters and I don't want my kids to either. For the price, I wouldn't have expected so much to be passed over, plus it's spiral bound and not super sturdy for young handlers. There should be some sort of disclaimer letting people know before they buy it that chapters are skipped. I may or may not have still bought it. I just didn't like not being informed about that. It should be titled "Book of Mormon for Young Readers abridged by Kelli Coughanour". I do applaud her for coming out with a book that is visually attractive to kids, though. I just want the buyer to know before they purchase it what I didn't know, and then decide from there if they want it or not.